BREAKING NEWS : Djou now open to raising GET for rail project. Flip-Flop Alert: Civil Beat reports late today that RINO Charles Djou is "now open to raising taxes to build full Honolulu rail route." Suddenly sounding a lot like his opponent, the mayoral challenger said federal insistence on building the line all the way to Ala Moana is a "game-changer." 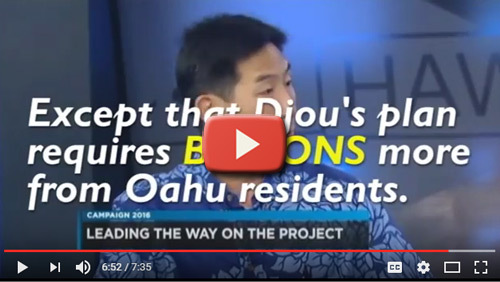 HIRA knew (and warned everyone) that Djou was lying when he previously said that he could 'build transit all the way to Ala Moana and beyond with no additional taxes'; even though everyone knows the deliberately lowballed mega-project runs completely out of money at Middle Street (if not before). Now, faced with his own shibai and plummeting poll numbers, Djou admits that more taxes would be needed and he's okay with that. Djou's inner Democrat is raging , according to Djou's statement to Civil Beat: "For me it's about pragmatism and getting the job done. That's far, far more important here than any sort of ideology," said Djou today. Those aren't the words of a fiscal conservative or even a Republican, rather a liberal opportunist with no ethics for either telling voters the truth or saving them money. Oahu voters were warned by HIRA about Djou. He is a fake Republican and a fake "fiscal conservative". 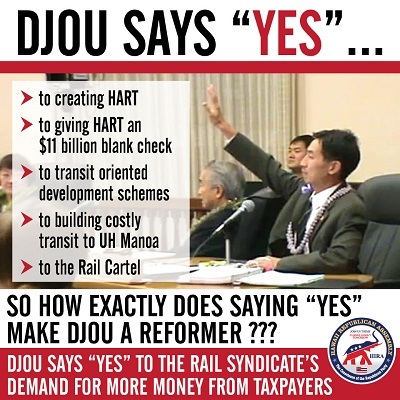 It should come as no surprise to anyone paying attention that after former city councilman Djou founded the massive new permanent City bureaucracy called HART, gave the HART agency a blank check to build 34-miles of rail (way past Ala Moana), demanded zero accountability from HART in writing his HART-creating legislation, threw his full support behind Transit Oriented Development and the super-expensive Airport rail line, and then spent the past few months of his campaign outbidding Caldwell by promising to build mass transit all the way to UH Manoa and Waikiki, he turned out to be a big taxing, big spender. His "golly gee, I hope we don't have to actually raise taxes" schtick is even more offensive than his flip-flop. He knows that his HART agency ran out of money. REALITY CHECK : But today's flip-flop is NOT really a new policy from Djou. Again, anybody paying attention knows he has only been pretending all this time to oppose taxes. 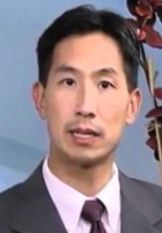 Just watch HIRA's video like nearly 80,000 other people and you'll understand how -- with only the slightest nudge from Obama's bureaucrats and some local Democrats -- Djou's inner Democrat has come out just 69 days before the General Election . . . the REAL Charles Djou. This is the very same Djou who used his position on the City Council to push a resolution alongside progressive Democrats which calls for Barack Obama to create a new, expensive, racially divisive government and Democrat scheme to be established for the exclusive benefit of politically-connected part-Hawaiians only . . . breaking up land and families and harmony while massively increasing the cost of living to pay for that new government . . . just like higher taxes for rail will increase our already high cost of living. 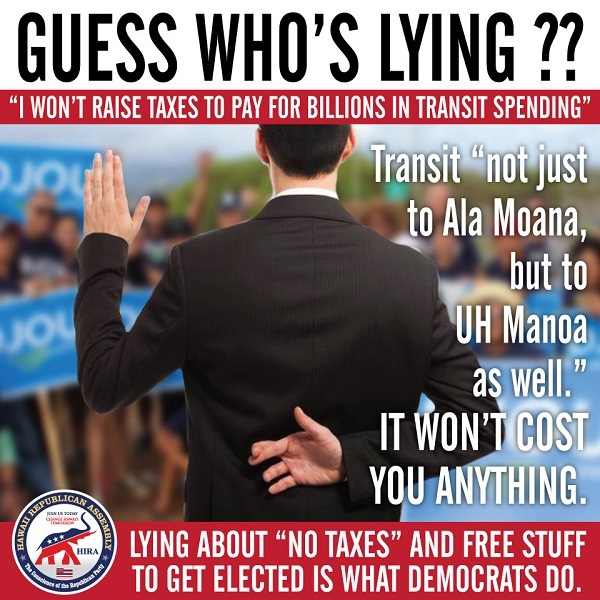 BOTTOM LINE : Djou is a fake Republican determined to do the bidding of the Rail Cartel -- a total phony-baloney who is as much a slave to the Rail Cartel as most other politicians of either party. For Hawaii's Republican Party to embrace Charles Djou would lead to the death of the Hawaii GOP for another 62 years. HIRA strongly condemns these tax hikes and wasteful spending and strongly condemns politicians like Djou who merely pretend to oppose these policies. BETRAYAL: The cat is out of the bag. The emperor has no clothes. 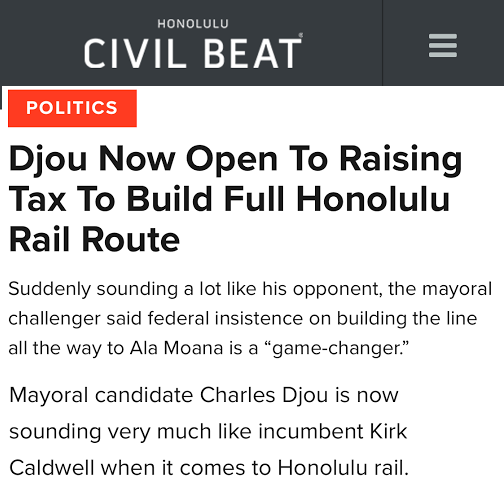 Djou will raise taxes and build rail -- just like Kirk Caldwell. Auwe!!! A REAL Republican would lead the fight against more taxes and more wasteful spending. All voters, especially you, deserve to know what you'd be getting and what's at stake. If you haven't read yesterday's call to action by HIRA which demands that our party's State Committee and our 2016 candidates lead the fight against higher taxes and government waste, please click HERE. Mahalo for your attention to these critical issues which will affect all of us for generations to come. 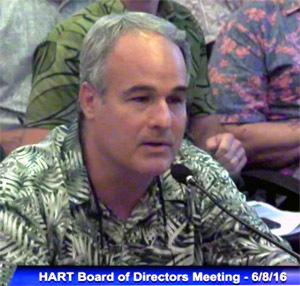 Your feedback is always welcomed by HIRA and you are invited to e-mail us at info@hawaiirepublicanassembly.com. Thanks again!